This post is part of the 28 days of Naptime Craft Time series — a month of simple DIY projects for your home that you can complete during naptime. See all the posts in this series here. 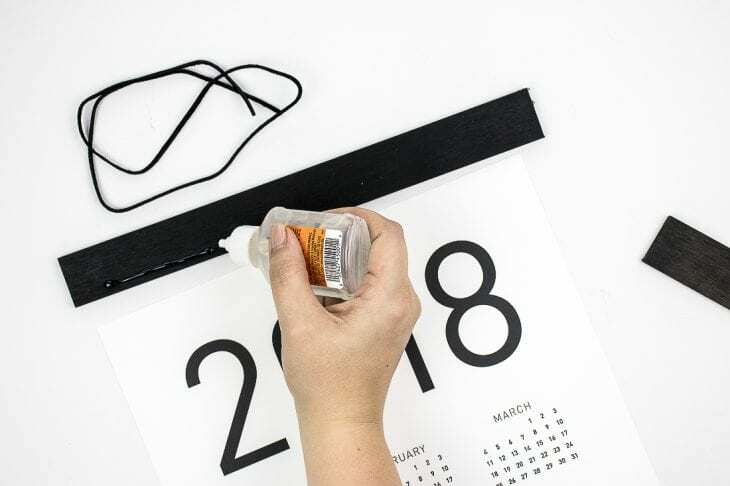 Decorate your office with this DIY 2018 wall calendar idea. Free printable included! 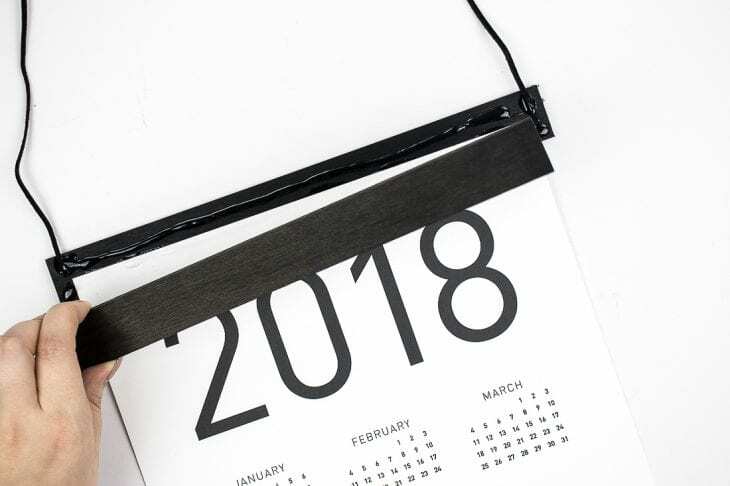 This year at a glance calendar is perfect to display when you just need to quickly see the dates. Are you loving the new series so far? I’m having so much fun sharing all these simple projects you can do. 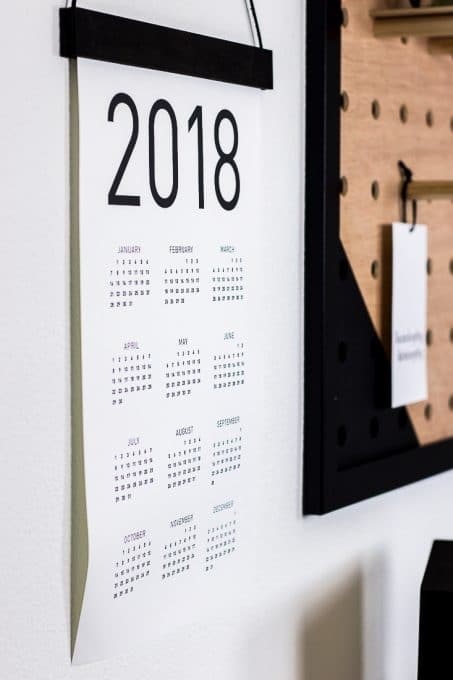 I love having a calendar displayed near my desk and hadn’t found a good one yet for this year so I just decided to make one up. This project is so easy, takes literally 10 minutes, and is practical to have around. 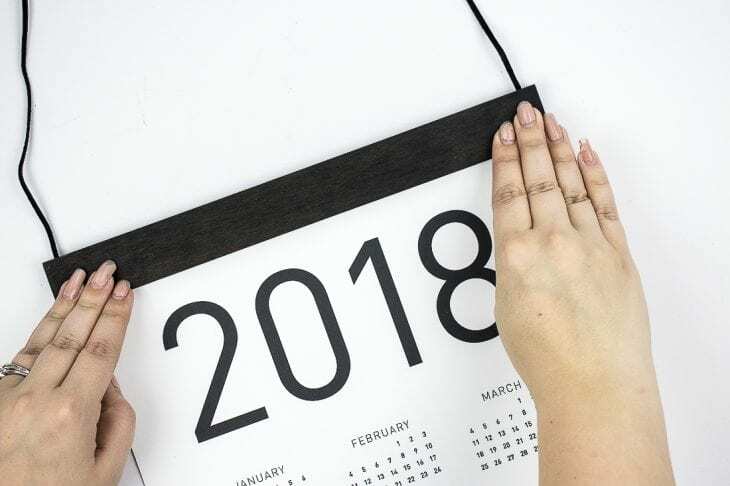 Let me show you how to make this 2018 wall calendar. *This post contains some affiliate links for your convenience (which means if you make a purchase after clicking a link I may earn a small commission, but it won’t cost you a penny more)! Click here to read my full disclosure policy. 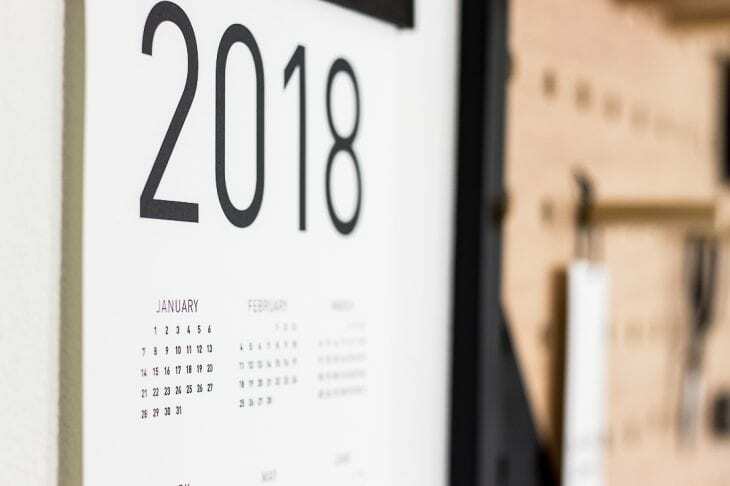 First, grab this download below to get your free 2018 yearly printable. Print it on 11×17 paper. If your printer doesn’t print that large, just have it printed at Kinko’s or Office Depot for a few bucks. Cut your paint sticks down so you have two 12″ long boards. The regular size paint sticks are just a little bit too short, but the long sticks you can find at the paint desk at Home Depot for free. If you can’t find paint sticks, you could also grab a 1×2 common board for a few bucks at Home Depot. Give your paint sticks a quick sand and then wipe it down with a dry cloth to remove any of the dust particles. Once it’s cleaned up give it a few coats of paint and just make sure you get all the sides too. 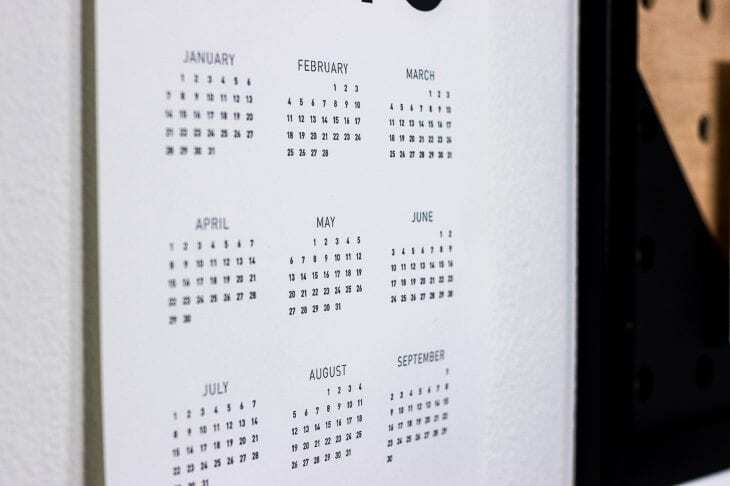 Once the paint has dried it’s time to assemble your wall calendar. Cut your leather lace to whatever size you want for hanging. I used about 14″. 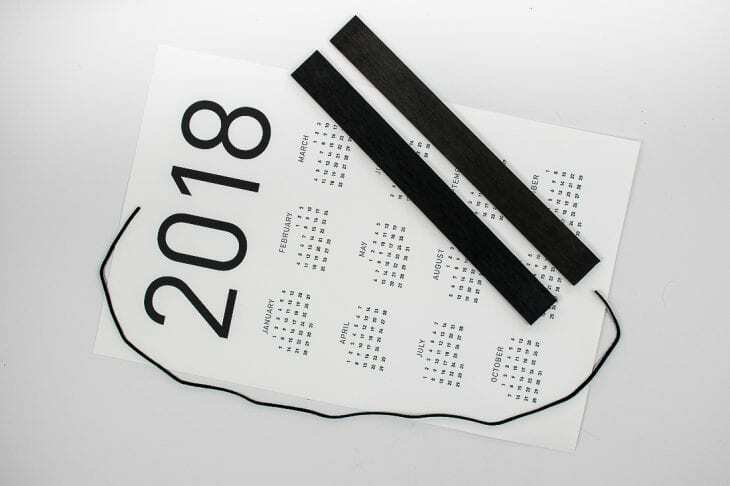 Glue the top of your calendar to the bottom of one of the sticks. I used gorilla glue, but you could also use hot glue, super glue, or wood glue to hold it all together. Add two small strips of glue on either end of the stick to hold the leather lace in place. Add another strip of glue above the paper and place the second piece of wood on top to sandwich it all together. Place a heavy stack of books on the wood for an hour just to make sure everything is stuck together well and then you’re done. Hang that wall calendar up and enjoy. 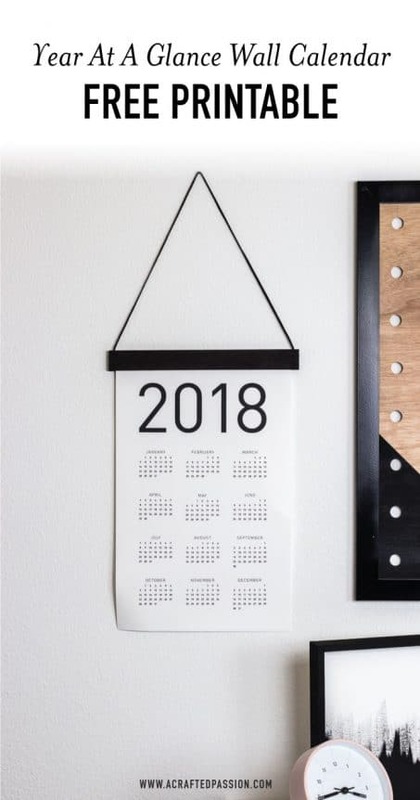 I love the minimalist look of this calendar and how simple it is. More is not always better. 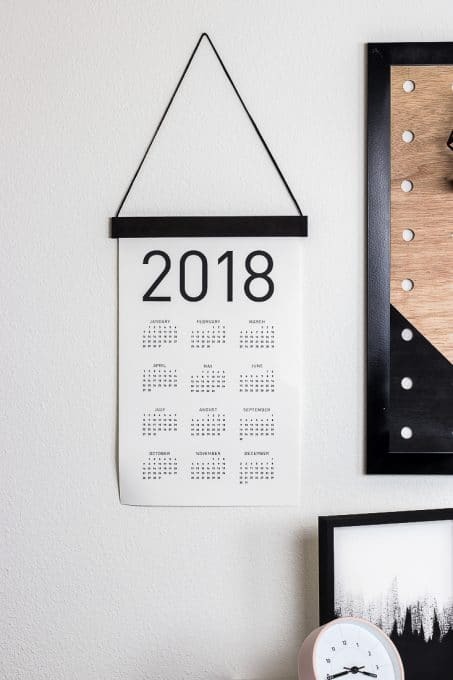 Where would you hang this 2018 wall calendar? Thank you for sharing this DIY tutorial.